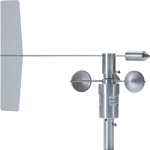 Wind vanes measure wind direction and are often used with anemometers, which measure wind speed. 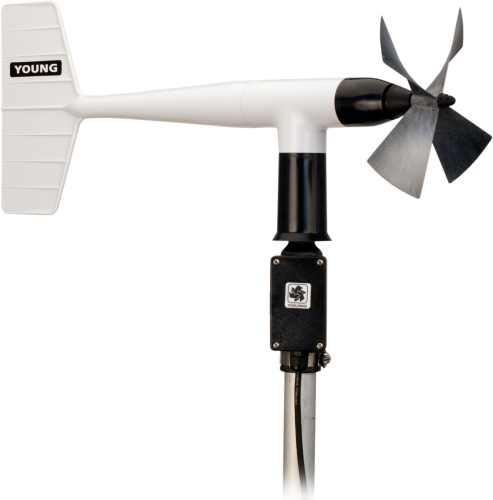 Campbell Scientific offers a variety of anemometer designs: cup, propeller, ultrasonic, sonic, and lidar. Most of our wind sensors are modified slightly from the manufacturers’ stock items so that they may be used with our dataloggers in research, air quality, and general purpose meteorological applications. Can a sensor cable be shortened? Sometimes, an old cable can be replaced with a new, shorter cable. Some sensors have bridge completion resistors at the pigtail end. Some sensors are calibrated to length. Sometimes the color in the insulation may not be the same as that visible at the pigtail end. Because of the potential issues, do not cut the ends off any sensor cable without first contacting Campbell Scientific to discuss the sensor in detail. Whenever possible, purchase a sensor with the desired cable length. Some sensors have a user-specified cable length, whereas other sensors have a set cable length. Sometimes, an old cable can be replaced with a new, longer cable. Splicing cable together increases the likelihood that water may enter the cable and cause shorting, corrosion, and some other potential issues, which in turn can cause measurement issues. Because of the potential issues, do not splice any sensor cable without first contacting Campbell Scientific to discuss the sensor in detail. Can a sensor cable be replaced? Many times, but not always, a sensor’s cable can be replaced with a new cable. This is helpful if the original cable was damaged or if its length needs to be changed. If the cable is attached to the sensor using a connector, Campbell Scientific will sell a replacement cable. For example, a 05106CBL-L is a replacement cable for a 05106-L. Replacement cables are listed in the “Replacement Parts” section of the Ordering information area of the product page. If the cable is attached to a sensor through a user-accessible terminal block, a raw cable can be purchased to replace it. For example, to replace the cable on a 05103-L Wind Monitor, order the desired length of pn 9721, 24 AWG 3 Twisted Pair Shielded Santoprene Cable. As another example, the raw cable for a TE525-L Rain Gage is pn 9661, 22 AWG 1 Twisted Pair Shielded Santoprene Cable. If the cable is an integral part of the sensor, the cable cannot be user replaced, and the sensor must be returned to Campbell Scientific. Some examples of sensors that fall into this category include the 107-L, 109SS-L, 229-L, CS547A-L, and CS650-L. For the process of returning equipment to Campbell Scientific, refer to the Repair and Calibration page.